I love Royce’! I allotted a considerable portion of my spending money in HKG for Royce’ when I went there last week. My (diabetic) mom was raving about it when she had some after lunch today. She also liked the choco covered potato chips- too bad we had to limit her portion as Royce’ doesn’t have sugar-free options…Happy there’s an outlet in Rockwell na! Chocoholics attack! Got acquainted with Royce’ in their Singapore store…Choco fans will be happy!!! If you want to impress someone bring a box of it. It really melts in the mouth….cheaper and for me better than Godiva. Yup! We were there this afternoon, and glad to see that the shop was open for business. Mmmmm. This will be a wonderful Christmas indeed. Thank goodness the office is very near Rockwell! Manila Diamond used to sell these small pieces of, well, heaven. Ah…can’t wait for tomorrow! Joey Pacheco, MM said Royce is a great Christmas gift for a foodie friend. Di ba friends tayo? thanks in advance for your Royce gift ha kasi, ikaw ang nasa Manila and walang Royce dito sa Cebu. hehehe! WHAT??? I was just in Rockwell tonight, I could’ve gone! Darn! P550 a pop?!? What economic crisis?!? I lo-lo-love Royce’ Nama Chocolates and will definitely be setting aside a portion of my Christmas budget to give these as gifts — to myself! Hahaha. Can you spell CHOCOHOLIC? We don’t have Royce here in Boston. I love Japanese Chocolates though. Maybe one day pag bumisita kami sa Pinas we can check out that store. This is a great site btw. ‘s is added to form the possessive singular of nouns, as in Royce’s chocolates. Exceptions: Classical or biblical names, such as Moses, which take only an apostrophe: Mosesâ€™. However, the Libertarian approach says eiher way (just “‘” or “‘s” is fine. What’s important is we use “‘s” properly, mainly to denote possession (MM’s blog) and not plurality (banana’s for sale). Wishing there’s one in cebu..
Marketman, you might want to entertain yourself with the book “Eats, Shoots and Leaves” (subtitled “The Zero Tolerance Approach to Punctuation”) by Lynne Truss. Highly recommended! ooohhh!!! I love love love Royce!! this is my grammar guide. i hope it help’s, helps, help;s, help*s, hell!!! wow, such rave reviews! =) will surely try it before the weekend. While it may end in a sibilant, the apostrophe still doesn’t make sense. You don’t see Godiva or Lindt denoting possession at the end of their titles. Anyway, they use an apostrophe much the same way – because it is aesthetically pleasing to look at. I lived in Japan on and off for 18 years and learned about their naming schemes from my Japanese Business Management Professor who is a retired CEO of Mikimoto Pearl Company. Eegads Marketman! I would have believed that the English IB class from our illustrious alma mater would have left an indelible impact on your command of proper composition and punctuation. IB english never taught the grammar rules! It taught us to decipher amorphous meaning from literature and to bs like crazy. For english grammar or the lack of it, it predates 10th grade english classes. Welcome to Manila Royce – wish you the best and hoping your cash register rings like jingle bell! Lee, haha! My daughters love that site!!!! Good for a lot of belly laughs, belly’ laugh’s, bell’ly laughs’, whatever!!! 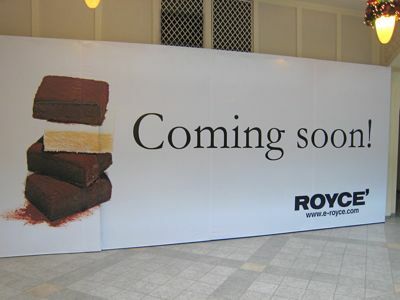 My cousin had been excitedly waiting for Royce’ to open in Manila — my family is notoriously chocoholic. Last week, she happened to be in Serendra and saw that Royce’ was for sale in a store there; since she was craving it so much, she bought two boxes. When I texted her this week that Royce’ was finally open in Rockwell, she lost no time heading over. Naturally, our expectation was that the official Royce’ store would be even a little cheaper than the one in Serendra. She was surprised to learn that it was the same price, so she mentioned it to the manager. The manager haughtily told her that the other store was not licensed to sell Royce’ and that their products might already be old. My cousin was turned off by her reply, so she rolled her eyes and walked out of the store. Now, the manager might very well be right — since the Serendra store is not the official store, their products have no guarantee of freshness (though the chocolates my cousin got were delicious; chocolates keep for a long time, when stored properly). But there could’ve been a nicer way to explain that, rather than being arrogant. Instead, they have potentially lost a customer who very possibly could’ve been a regular, and who could’ve eagerly spread the news about the store. It makes me sad to see snobbery in high-end stores. It’s very common and I think it’s stupid and bad for business. I’ve been thinking about this. What should the manager’s response have been? My cousin thinks they should lower their prices (which makes sense), but a manager isn’t authorized to say that. Could she at least have made her point in a better way? After all, I’ve found myself paying marginally higher prices when the staff is friendlier. I don’t think they should diss the other supplier until they find out more. However, if I did own the “franchise”, then I would advise the head office of royce to ask that supplies to other re-retailers are cut off. As for the pricing, I was surprised that the prices were 20-30% premiums over HK, where rental spaces and staffing costs are amongst the highest in the world… but then again, we may not have the same volume here. I totally agree with you, MM. Customer service in the Phils. is generally below par, which is disappointing for a country that prides itself on hospitality and the friendliness of its people. I’m more inclined to let it go when I’m in a cheaper establishment, but when I’m in a high-end store, I expect better treatment. Instead, it’s often the opposite. Mind if I ask how big the box of chocolate is? I want to give something nice to my Grandparents for Christmas. I’m worried that my cantankerous but adorable Grandpa will complain about the size of the box and say, “yan lang? ?” haha! Tings, the boxes are TINY, but the contents pack an impressive wallop tastewise. If you are going for golpe de gulat, forget Royce… try biscotti at Bacchus Epicerie, beautiful old-fashioned printed tins containing lots of air and some cookies… at roughly PHP990 for the largest size. i was in rockwell the other day. how did i miss this? again – must be due to living under the proverbial rock. Thanks MM! You just made my Christmas shopping easier! I visited the Louis Vuitton store in Makati and had planned on purchasing a purse since the the one I had brought (also an LV) was too small. I was dressed like a tourist (t shirt, shorts, sneakers). The saleslady eyed me up and down when I entered the store (she probably thought I couldn’t afford anything they sold). What a disappointing experience! I told her that I saw something better at the Burberry store and would be taking my business there. I’m always willing to pay premium for quality items (food or otherwise) and top notch service. I won’t waste a penny on snobbery or haughtiness. Hi MM, off topic…just want to say that I saw you today (Dec 7) at the lower level of Powerplant, you were browsing thru the dessert tables in the concourse and later w/Mrs MM and the Teen. I wanted to say “HI” but I thought I’d respect your privacy instead. Thanks MM, next time I’m back in the Philippines and happen to see you, I’ll say “Hi”. Before I left for vacation I told my friend, who’s also an avid reader that my trip would be complete if I see MM at Salcedo market so I never have thought that I’ll see you at Rockwell! My husband and I were eating at Milky Way and you were looking at the “tortas” by San Lo.